Ahhh, Spring is here! That means the "crafty" season has begun! I have always loved strolling through a craft fair marveling at the wonderful things created by true artisans. Now that I am one of those "crafty" folks, most weekends I am somewhere out selling my wares. But, I have a hard time staying behind my booth. 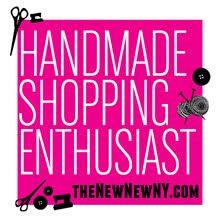 I am still interested in checking out other vendors' creations. One thing that draws me to a table are the displays. I particularly love when artists choose unconventional objects. Interesting displays are always an eye-catcher, and I took a few pictures while I was at a craft fair last weekend. 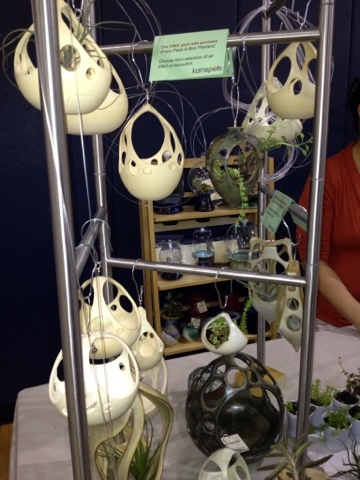 Kam, who owns Kamspots had an interesting display for her ceramic hanging planters. First of all, her planters could have been displayed on a paper plate, and still gotten a second look (they are absolutely beautiful!) I was intrigued by the display, and she told me that it was a towel rack...yes like the rack in your bathroom...That's what I call creative! Angela Colombo, designer and creator of EnchantraGirl injected a bit of nature into her display. 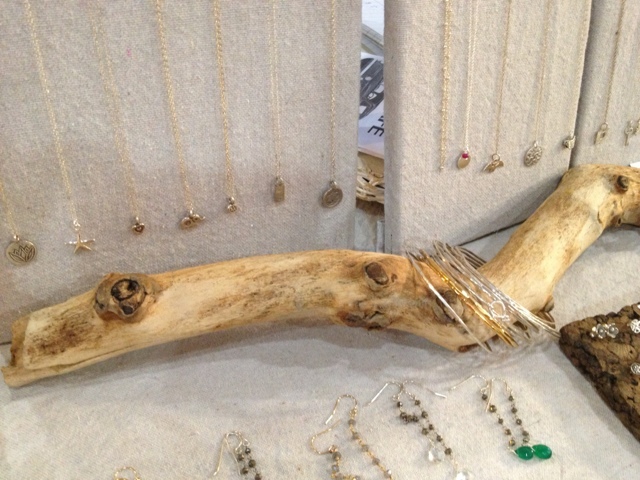 Turning a bit of driftwood into something to showcase her delicate bracelets, was a smart move. It is a nice change from the black velvet busts that so often adorn a jewelers craft table. 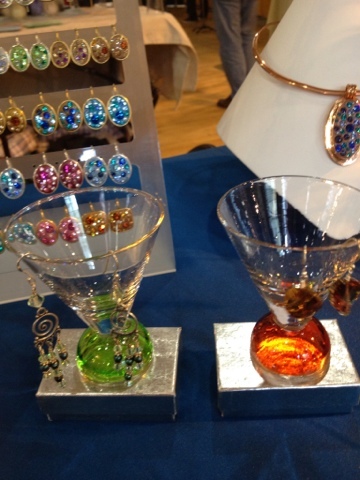 Lisa LeClaire of Lisa LeClaire Designs highlighted her jewelry with some colorful shot glasses. They were the perfect fit for her eye-catching, sparkly jewelry. Her entire table was shining, and it was hard not to take a second look! And finally, a little creativeness from Nordea Soaperie (yes, that would be me!) 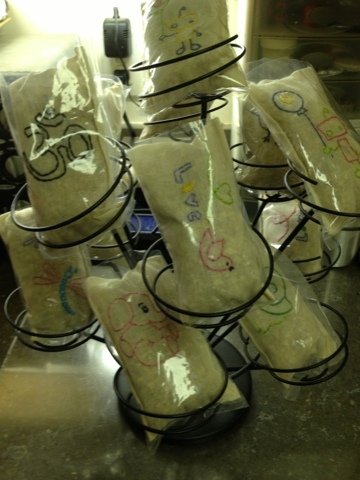 I had a hard time figuring out how to display my lavender sachets. I embroider each design by hand, and didn't want to throw them in a box. I found this display meant for cupcakes! It was perfect because each design can be seen, so customers can check out all of the designs without sifting through a box! Remember that the annual Spring Handmade Cavalcade is coming up in a couple of weeks (May 4th.) I would bet that there will be a lot of creative displays to be seen. Of course it goes without saying that those displays will be showcasing some wonderul crafts too! Hope to see you there!